Welcome to Hendon School of Motoring. 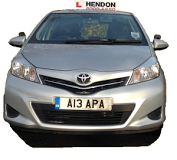 An established independent DVSA Approved Driving Instructor (ADI) based in Hendon providing driving lessons and courses for novice and experienced drivers alike. With over 35 years experience in the driver training industry Hendon School Of Motoring have a vast amount of knowledge in what we do. Hendon School Of Motoring have helped thousands of learner drivers successfully pass their driving test over the last 35 years. Finding the right driving instructor for you can be confusing, please read the "benefits of choosing us" on the right hand side before choosing a driving instructor. Over the years we have built up and maintained an enviable reputation and our driver training services are highly recommended from previous and current pupils. If you are looking for a reliable, patient and friendly driving instructor look no further and make Hendon School Of Motoring your first port of call.